Monitors tally the number of votes cast in Cuyahoga County Tuesday night. CLEVELAND, OH (WOIO) -- During Tuesday’s midterm elections, so many people cast ballots, the Cuyahoga County Board of Elections had to print some more and race them to the polling places. A typical midterm election has a voter turnout of about 40 percent. 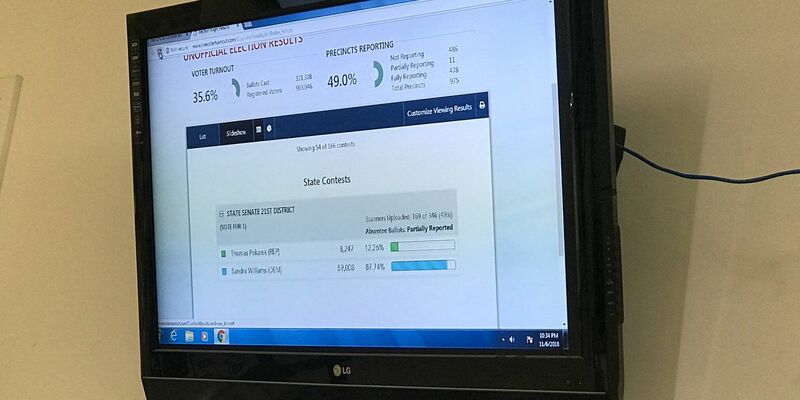 This one topped 54 percent, with the unofficial numbers growing over the night. That’s good news for democracy, but it did create some scrambling for election officials. “Our most challenging part of the day with the voters and the poll workers has been making sure we had enough ballots at each precinct. You know, we had a higher voter turnout than expected, so we had to print some more today and have them delivered to the precincts," said Board of Elections Director Pat McDonald. McDonald said they were able to get all the ballots to the polling places before anyone ran out. He says he initially estimated about 40 percent for this election, like most other midterms, but as estimates grew, they had to adjust their plans. There is a big difference in the number of voters from precinct to precinct in Cuyahoga County. One in Cleveland Heights hit nearly 78 percent before 11 p.m. Another on the east side of Cleveland clocked just 6 percent of registered voters casting a ballot.